Par 3 Scorecard Hole 1 – Our Par 3 golf course starts with the shortest hole. A short 84 yard wedge over water with a two tier green. Make sure if the pin is on the second tear that you hit it far enough for there is a grass divider. Par 3 Scorecard Hole 2 – This 130 yard par three has a creek in front so make sure you have enough club. Par 3 Scorecard Hole 3 – Time to make a birdie on this straight 107 yard par three. Par 3 Scorecard Hole 4 – Hole number four is our longest par three with mounds protecting the green in front. Hit a nice straight shot to a rather large green. Par 3 Scorecard Hole 5 – This 138 yard par three has an elevated tee box with trees all down the right side. Par 3 Scorecard Hole 6 – Take time to appreciate our signature par 3 golf course hole! 101 yards over water with mounds in the back of the green. Par 3 Scorecard Hole 7 – Make sure you hit the correct golf club on this 108 yard par three. The green is elevated with a large ravine in front. Par 3 Scorecard Hole 8 – It’s all downhill from the tee box to the green on this 126 yard hole. 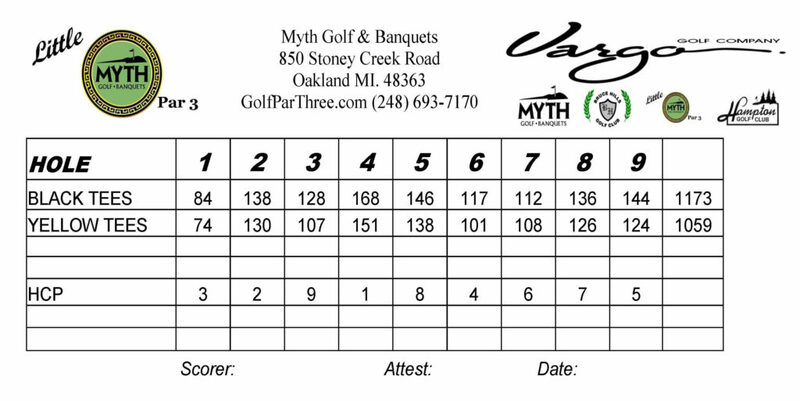 Par 3 Scorecard Hole 9 – Finish strong with a good shot through the willow trees and over the creek to a small green 124 yards from the tee.